You can plan your engineers workload, service work, breakdowns, call outs and customer visits quickly and easily, to improve your efficiency, save time and reduce your overall costs. Plan the workload and jobs for your service and maintenance engineers. Record all types of service work and job planning with full reporting and analysis. Link engineers, call type, customers, equipment, and any other requirements. Integrated google maps and tomtom tracking. Below is just one example of how scheduling software can be used and why Schedule it was chosen by a global service company for service engineer planning. Schedule it takes pride of place in the center of a large service company on 2 large TFT screens allowing everyone to see the activity and location of over 100 employees and service engineers covering UK, Ireland and Sweden. Network connectivity allows a further 11 office staff around the company to view live up to date information at their desks and make updates where necessary. Email alerts keep other users and remote staff informed of any changes as they happen. Instant emails send out the planned schedule to the remote users who can also access their job list online or via any email application. Remote online access allows the coordinators to review and adjust events planned for the service engineers whilst away from the office. The service engineers can access their jobs on their iPad, iPhone and Android devices. Save time and money with the complete solution to all your engineer scheduling and planning needs. If you're interested in getting free scheduling tips and great articles to help improve planning in any business, please join our newsletter by adding your email below. You can unsubscribe at any time and your information is never shared externally. 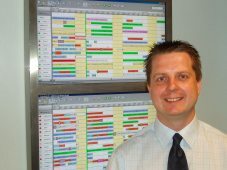 Schedule it has been fantastic to track our resources work and schedule work shifts for our engineers"
We have been using it since 2006... Easy to use program helps keep training to a minimum and excellent support from all at the Schedule it team." Fantastic tool and friendly UI. It has helped us to massively improve the necessary record keeping as well as all the planning. The business has seen huge improvements since we've implemented this." For the first time in seven years of operations we feel in control. Not only is the system fantastic but the service you get priceless! Total control of our company. At last." Absolutely brilliant... Really impressed by the standard of customer service." We have found Schedule it to be perfectly suited to our needs, and there are clearly additional features of this robust scheduling program that I have yet to explore. Simple to use yet full featured, and with outstanding support." We use Schedule it for our vehicle and event logistics, it has changed the way we operate our logistics. Schedule it has enabled us to work smarter, which is always a bonus these days."